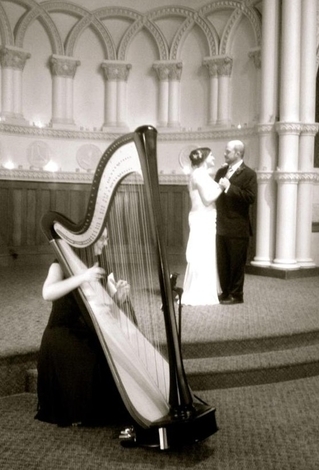 I am delighted that you are interested in having harp music for your upcoming wedding! As a professional harpist, I love working with couples to create a wedding music experience that is unique and memorable. 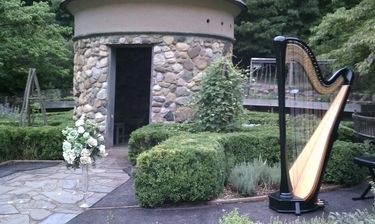 The harp's music is perfect for all elements of your wedding, including the ceremony, reception, and rehearsal dinner. Harp music at your wedding adds a touch of class to the celebration and makes your event sophisticated, romantic, and unforgettable. The harp is the right fit for any venue, from a large cathedral to an intimate garden ceremony, and looks beautiful in your pictures! Yes, I can play outdoors (with protection from the elements). From wedding classics to soft jazz, rock ballads to folk songs, the music of the harp will appeal to all of your guests, and have them talking about your wedding music for months and years to come. With my varied repertoire, the harp can fulfill all of the musical needs of your wedding, whether you prefer traditional or non-traditional songs. Review my list of most popular wedding music for some ideas of selections chosen by my recently married couples. Please select Ceremony, Reception, or Rehearsal Dinner to find out more about the services I can provide for your wedding, or go ahead and request a Quote. I am available worldwide for destination weddings. In addition to live music, I also work with couples locally and across the globe to create custom wedding music recordings for their ceremonies.